One thing that says summer to me is a Diet Cherry Limeade from Sonic. I’m sure I have spent a small fortune on them. If I am anywhere near Sonic during their “Happy Hour,” I am there. 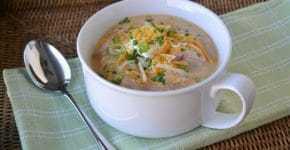 I have seen a lot of recipes that copy the recipe, and I have just tweaked a basic recipe for my family. 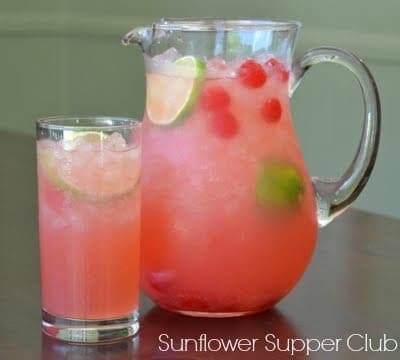 These are super simple to make and very refreshing, which will be great today when our forecast here in Kansas is a high of about 107 degrees! Combine the frozen limeade and Diet Sprite in a pitcher. Juice 2 limes and add juice and rind to the pitcher. Add about ½ of the juice from the jar of cherries, reserving the cherries for garnish. Taste and add more juice to desired sweetness. We use a little over ½ of the juice for my family. You can always add the juice to the glass to make it sweeter for someone who doesn't like it so tart. Serve over crushed ice and garnish with lime slices and cherries. I’ve linked this to the Weekend Potluck. Oh that looks like it would quench any thirst on a hot summer day. Lovely and refreshing! That looks like a a real thirst quincher, my husband loves cherry lime aid so will be adding this to the list! This recipe looks and sounds sooo refreshing! I would drink this just cuz I love the pretty pink color! So refreshing. I have happy childhood memories of going to Sonic and enjoying Cherry Limeade’s during our Summer vacations in Kansas. They’re still one of my favorite drinks of all time. Doesn’t the limeade and maraschino cherries have sugar in them? Sounds awesome but diet????? Those ingredients do have sugar but we make the limeade with Diet Sprite to lower the sugar content. The “diet” in the recipe is just that it is made with Diet Sprite. Thanks for visiting!